A circumpolar species. Easily overlooked in shallow to deep water of lakes and streams. The foliage tends to be dark green, and the bases of the leaves, although they may touch each other, are not confluent at the nodes. In C. heterophylla and C. palustris, the foliage is light green (especially when submersed), and the leaf bases are slightly confluent at each node, forming a narrow (not always easily detected) membranous wing across the sides of the stem. MICHIGAN FLORA ONLINE. A. A. Reznicek, E. G. Voss, & B. S. Walters. February 2011. University of Michigan. Web. 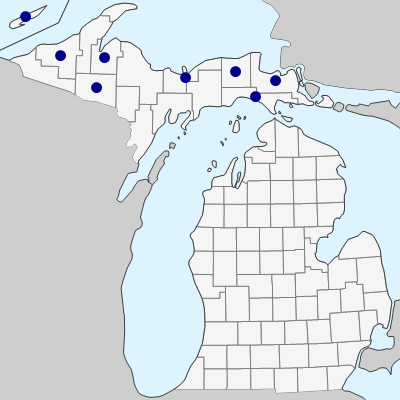 April 19, 2019. https://michiganflora.net/species.aspx?id=1930.